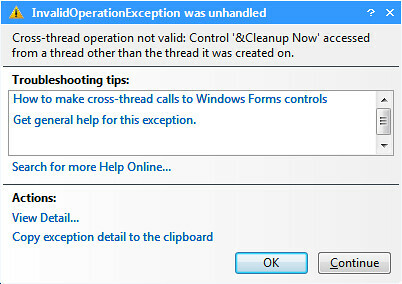 This exception is caused by the Home Server Console doing something it shouldn't (changing an object created/owned by one thread from another threads)... and instead of not doing it, the Console simply suppresses the error when normally running, something that isn't as easily hidden when debugging. In order to work around this error we can do the same thing that we do to suppress it when doing remote debugging, set the static Control.CheckForIllegalCrossThreadCalls property to false early in our add-in's code (only when debugging and testing your add-in) to prevent the runtime and debugger from raising an exception. One problem we run into by making such a work around is we also throw out any catching of similar bugs in our own code, instead it sometimes is preferable to not make the change and work around the underlying issue as we do with a higher version of Visual Studio. If we do not set the property we will quickly run into a limitation the Express Editions which we can't so easily otherwise work around. While the non-Express versions Visual Studio allow you to attach to a running process at any time, Express only allows you to attach to the process when first launching it, nor does it allow for launching of the project (or some program that will use it's output) from the development environment without attaching the debugger as you can in the higher versions. In the mean time however this means that debugging and testing an add-in in a copy of Visual Studio Express that is running on a Windows Home Server can be more difficult than than if a higher version is used, requiring either use of the CheckForIllegalCrossThreadCalls property, manual testing outside of the debugger, or careful avoidance of those cases where the exception is likely to be raised... the most common location I've seen it is when launching the Settings dialog.